IRELAND has many deserts. They cover about one-seventh of the land and they are as wet as most of the great deserts of the world are dry. This is not a new simile for the bogs of Ireland but it is a good one and bears repeating. Deserts have become a challenge to modern man and while some seek to irrigate parched lands the peat technologist has learnt that it should be his singleness of purpose to extract the moisture from the semi-floating vegetation which constitutes a bog. This water is his challenger and his bete-noire. He must consider carefully how best he can remove it, for it does not separate easily from the organic structure, and the dry product is, relatively, a low grade fuel which must be cheap to compete on the open market. From this standpoint of dry peat (or turf) as a fuel, the only known economic method of removing most of the water is by drainage, and by air drying during the summer months. Dependence upon the weather greatly increases the difficulties of the industry and at best one-third of the weight of the final product is water. Before a bog is drained it contains nineteen times as much water as dry material; after drainage it contains only ten times as much, yet this is still an enormous amount of water compared with the final air dried product. Not only has all this drying to be effected but it must be achieved to within quite small limits. A relatively small difference in water content of the final product has a marked effect on its value as a fuel. It will cost a customer 10% more if he uses turf containing two-fifths water instead of one-third water. This can make all me difference between the fuel being competitive or not. It is small wonder then that turf producers look anxiously at the sky during the summer harvesting period, or that they maintain a good drainage system. To illustrate the magnitude of this water influence the diagram overleaf sets out the relative moisture-solid ratios at the different stages. This high water-content of peat confronts the peat engineer with two important problems: 1. All excavating machines, and more particularly the drainage machines, must have very low bearing-pressure to avoid sinking. 2. The machine-cutting rates must be as high as possible per horse-power-hour, since so much water is being handled in each operation. For example, the rate of handling of solids during cutting for drainage is only 5 per cent. per ton handled, compared with 67 per cent. per ton handled of the dried product at 33 per cent. water content, usually referred to as m.c. (moisture content). The rest of the material handled is water, which is later drained off or evaporated. It is instructive to consider the problems of low bearing-pressure machinery and of mechanically handling high-bulk and high-moisture peat. Most contractor’s plant has ground bearing-pressure varying from 4 to 10 pounds per square inch. Even in caterpillar tractors for work on soft land, pressures less than 3 to 4 pounds per square inch are rarely necessary. Undrained Irish bogs are so soft that pressures exceeding 11/2 pounds per square inch are dangerous and 1 pound per square inch is accepted as the desirable standard. Drained bogs are much firmer and pressures up to 21/2 pounds per square inch are possible, although 2 pounds per square inch is the standard recommended. If these pressures are exceeded on drained bogs, caterpillar track machines. Might sink until the machine frame is resting on bog top, but recovery is possible by planking beneath the tracks. If the pressures are exceeded on undrained bogs, however, recovery is extremely difficult. Undrained bogs have a relatively dry surface skin of vegetation with many small, and sometimes some large, open-water pools interspersed with hummocks of vegetation. By standing on such a hummock and gently pressing up and down with both feet, one can easily make the surface for some distance move up and down in a wave formation: the surface is virtually floating on the wet mass of peat below it. In such conditions one needs little imagination to realise the recovery problem should a machine travelling over it break the surface. Usually what happens is that the machine settles until it is partly borne by the torn surface and partly by the up-thrust of the displaced peaty water. It is not possible to plank beneath a machine under these conditions. Sometimes the machine has to be towed in this floating state for hundreds of yards until a drier part of the bog is reached where planking is possible, or where the machine will climb out by pulling itself onto the drier peat surface. To obtain machines for these working conditions the peat engineer has been left with no alternative but to design to his own specification. To convert standard tractors and excavating machines to suit the conditions of a soft bog is not only a very costly business, but is not usually satisfactory. Peat is so different in physical characteristics from most other geological deposits that it does not suffice to use excavating equipment designed for those other types of deposit. The requirements of high-volume, high-capacity excavating equipment for handling the soft peat is not met in standard equipment, which is designed usually for heavier, less bulky materials. A clay excavator rated at 100 tons per hour output would have an output of only about 50 tons of drained peat. Excavating machines are partly limited by their volume-handling capacity and partly by the “toughness” of the material being cut, within limits of power. For a given power, a much bigger volume-output is possible when handling soft peat than a material which is heavier or more difficult to cut out. 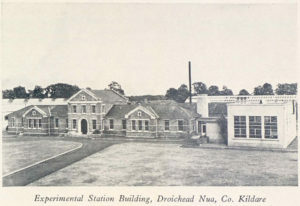 When Bord na Mona began its first post-war plan of expansion it set up a research department under the name of “Experimental Station” to assist in the development problems. Droichead Nua, Co. Kildare, was selected as the best available centre for the Station on the edge of the famous group of bogs known as the Bog of Allen. The basic nature of the industry outlined above clearly indicated the initial programme to be followed. Research was directed into high speed drainage machines, tractors with very low bearing pressures, hydraulically controlled attachments for these machines for site preparation work, and railtrack lifting and laying machines. At the same time production machines based upon foreign prototypes were being re-designed and put into use by the Board’s mechanical engineering department and new research ideas were applied in many of them. The lively spirit of a young expanding industry was building up in all sections of the Board and useful suggestions from workmen, foremen and field engineers were forthcoming. It became the function of the Experimental Station to handle most of those which required more research investigation, and also to deal with the growing volume of correspondence and exchange of ideas from inventors and foreign turf industries. One such idea, to produce turf using hydro-jet methods by washing out and settling the peat in drying fields, became a major project of research in the early years of the Station’s work. Similar schemes were operating in Denmark and Russia. Another production project of this nature was to investigate the winning of peat by the milled peat process in Co. Mayo, where one has to reckon with a high annual rainfall. Both these projects involved pilot production schemes operated on an experimental basis. 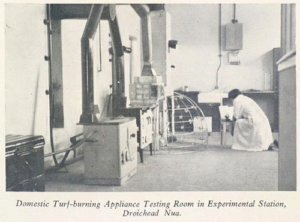 In the laboratory the extraction of crude wax, esters and resins from turf was taken up following pioneer work on the subject by University College, Cork, but until about 1952 very little utilisation work could be undertaken, so great was the pressure of production problems. The organisation of the Experimental Station has not changed since its inception. The Turf Development Act of 1946 conferred on Bord na Mona the necessary powers to set it up and its purpose was to make research into, and carry out experiments on, methods of winning and utilising turf. The object of the Library and Records Section is to collect and record all literature connected with turf and to establish contact with every turf industry in the world. This work forms the basis of literature researches into problems connected with our own industry, and from it material is made available from time to time on every known subject connected with the winning and utilisation of turf and the reclamation of bogs. A most comprehensive records and reference library has been built up forming an indispensable part of the investigations. This section has been set up to learn something about the raw peat material and the bogs containing that material. Classification studies have been made and arising from these it has been possible to make rapid surveys over the whole country to establish, for example, the distribution and likely areas where peat moss will be found. The Chemical/Physical Section has, as its main function, the improvement of the rates of drying of peat. This has involved investigation into the optimum particle size distribution of milled peat, the size and condition of the rows of spread sod peat, and the surface conditions of the bog on which peat is spread to air dry. The Mechanical Section, which includes a design drawing office and a mechanical workshop has in the past been primarily concerned with (a) the mechanisation of the manual operations which made machine turf winning so arduous and costly, and (b) on improvements in existing machinery to increase production. It is now dealing with problems of utilisation of turf fuel involving mechanical handling in large industrial boiler houses, and it is also studying packaging and grading developments. Efforts are being made constantly to upgrade the appliances which burn turf on an industrial and domestic scale. The fuel laboratory has been set up to test standard domestic appliances and to suggest modifications to manufacturers to improve them. Industrial boiler tests are carried out from time to time to evaluate the turf burning properties of new plant. The Librarian draws the attention of all the Board’s staff to new technological developments. Technical periodicals and magazines are circulated regularly; a Peat Abstracts series is produced and a translation service set up particularly for publications in German, Russian, Swedish and Danish. Visits abroad have become commonplace for the senior staff in general as part of a wise Board policy, and the very good personal contacts which have developed gave rise to the idea of an international conference on turf. So it was in 1954 that the first International Peat Symposium was held in Dublin under the auspices of Bord na Mona. It extended over a week, was attended by delegates from fifteen countries who contributed 54 technical papers covering almost the entire fields of peat winning and utilisation. Up to this time the work of research was directed by the Board from recommendations by a technical conference of senior bog managers and engineers which met periodically to discuss the programmes and progress. Already by 1954, however, a new phase was emerging. More attention had to be given to the utilisation of sod turf and briquettes as domestic and industrial fuel. Production was mounting to proportions which provided a large surplus of turf for these markets after the demands of the new electric power stations had been met. Very little in the way of efficient turf combustion appliances was available on the market. No industrial stoker had been developed for small boilers under about 20,000 lbs./hr. of steam and the standard open fire with the basket grate and small flues was most unsuitable. As more priority had to be given to research work on turf burning the Station came more and more under the influence of the Board’s Technical Sales requirements. A large and experienced production organisation had been built up on the bogs and in Head Office and by 1957 it was decided that the work of the Experimental Station should be mainly that of Research and Technical Sales. At a very early stage in their programme of research into the improved combustion of turf in industrial and domestic appliances, the Experimental Station staff realised that mere adaptation of coal or coke burning plant would not provide the desired results. Advantage had to be taken of certain valuable characteristics peculiar to turf, such as ease of ignition, low ash content and high volatility, and special furnaces, grates and stoves were designed for this purpose. Steady progress has been achieved and many manufacturing firms have taken up these designs and have marketed them with considerable success. In developing special combustion furnaces the following characteristics had to be taken into account. The temperature at which burning or oxidation begins varies from 150 deg C to 250 deg C, but the smoke or volatiles which then begin to be released do not ignite until a temperature of the order of 500 deg C to 750 deg C is reached. Volatile matter accounts for 63-73 per cent of the dry weight of peat, so that at a moisture content of 30 per cent nearly one half of the fuel volatilises before it ignites. Combustion-furnace design must allow for these characteristics. Additional combustion air should be introduced as secondary or tertiary air at suitable points in the hot gas path to ensure complete volatile combustion with the minimum of excess air. Heat-exchange systems, e.g., in boilers and drying plants, should also allow for the long gas flames which are formed. Variation in the composition of the fuel must also be considered. Though the chemical composition of peat, on the basis of ultimate analysis, varies very little from country to country, the phrase “peat-fuel” connotes not one fuel but many. Seasonal variations of moisture content may mean that in the same combustion-plant must be burned at one time of the year a highly reactive fuel of well over 7,000 BTU per lb. and at another time a fuel of 5,000 BTU per lb. which is quite difficult to ignite. (The calorific value of turf on an anhydrous basis is fairly constant at 9,200 to 9,800 BTU per lb.). The design of a boiler-plant which will deal with both these extremes with a high efficiency of combustion is attended by many problems. On the one hand, turf with a moisture content of 25% will burn completely and cleanly, and with a high standard of combustion efficiency, in a plant designed for bituminous coal. At the other end of the scale turf may be so wet that it can only be dealt with in an incinerator-like plant. Turf is an extremely reactive fuel, its reactivity apparently being due to its physical structure rather than its chemical composition. This would appear to be indicated by the fact that turf charcoal, which consists mainly of carbon having roughly the same physical structure as the parent peat, is equally reactive. Work done on coal cokes has shown that the resistance to shatter, which again is a function of the physical structure generally, decreases with increasing reactivity. Here again, however, wide variations exist between different types of peat and between peats which have been differently treated. A high degree of maceration will reduce reactivity, and peat which has been subjected to frost in the early stages of drying also suffers in this respect. The characteristic of turf which most seriously affects its small scale use, however, is its bulky nature. Although twice as much turf by weight gives as much heat as coal, this is equal to about four times as much turf by volume. Any fuel device which must be hand fed therefore suffers a serious drawback. This has led most of the Board’s fuel research into a policy of providing hopper and magazine units and, in the case of the larger industries, mechanical handling devices. If the appliance has to be refuelled only once or twice per day the bulk is no longer accentuated and for other reasons also this approach leads to better utilisation. This policy is not inflexible however. There are certain plants where hand-firing is still the most economic method. Not all the Technical Sales research lies in the sphere of fuel utilisation. From time to time projects have arisen on the use of Peat Moss in horticulture and as a livestock bedding. The use of peat moss as a mushroom casing arose from such a research project. The Experimental Station has to clear information on this subject and to assist, for example in chemical analysis, in the evaluation of the many new products which the Board’s competitors are continually marketing. Peat has certain industrial uses also, e.g., gas purification, for which at one time only the peat moss product was considered to be suitable. The development of cheaper peat in the form of milled peat, however, has brought this latter material into industrial uses which are expanding rapidly. The Universities on their own initiative use turf subjects for graduate and post graduate studies and sometimes these take place at professorial level. The further development of University research into peat has been accelerated by the Board having recently made a grant for one year’s post graduate study of humic acids in peat and by an offer made jointly by Arthur Guinness and Son and Bord na Móna to endow a new Chair of Industrial Microbiology at University College, Dublin, and to pay the cost of maintaining it for a period of ten years. The offer, which was subject to the new Chair directing its main work to the subject of peat, has been accepted by the University and steps are in hand to implement the proposal. The Institute for Industrial Research and Standards also engages in peat projects and has contributed useful information on peat wax, peat coke and tarry flue deposits. Research and development in turf is not limited to State Companies, Government Departments and the Universities, however. Turf has attracted men of genius, rich and poor alike, since it first excited man’s interest over 250 years ago. Fortunes have been lost in schemes which were usually most complex but which ignored the extent of the problem of water removal. Elaborate chemical processes were planned but no thought was given to devising a cheap way of producing the raw material. Now we have a cheap raw material and some of the old ideas on its utilisation are being reconsidered. This article has been directed to explain a little of what has happened in turf research in Ireland and broadly what organisations exist for carrying it out. The reader will appreciate that much more could be written on what is happening at present and what is proposed for the future. It is hoped that more fundamental research to improve drying and to clarify the chemistry of peat in its drying, combustion and horticultural utilisation will be carried out by universities. The Experimental Station will continue to work on further improvements to upgrade turf as a fuel and will apply the university work to bringing out new and better products. The bog production organizations themselves hope to devise ways and means of exploiting small bogs and also in turn will be able to apply usefully the work of the universities and the Experimental Station to further expand the industry. A great deal has been achieved by Bord na Móna in converting over 100,000 acres of desert bogland into a thriving industry. Out of the remaining 1.5 to 2 million acres of bogland left, some further hundreds of thousands of acres may be exploitable using new methods for new products. The balance may be reclaimed. It is clear that the work of the Board is only beginning. Research has played its part and it must continue to do so.